God and what I believed about them “getting back on track” with God, and sometimes for the loan of a rosary or prayer book. Born in Westphalia, Michigan on March 16, 1937, Phyllis Catherine was the third of six children of Melvin and Marian Wieber. Phyllis attended St. Mary’s grade school and graduated from St. Mary’s high school. She worked at a car dealership in Lansing before entering the Dominican Order in 1961. Phyllis attended Aquinas College, attended summer workshops and earned her certificate for Food Service Management from St. Louis University. She was given the name of Sister Ann Terrence at her reception in 1962. 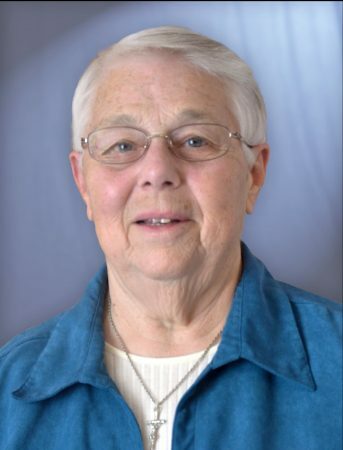 Sister Ann Terrence enjoys many sports, card playing, working puzzles. Sister’s passion is to remember each and every one of her nieces and nephews and their families with a birthday card and an anniversary each year.